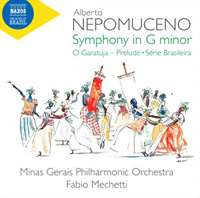 ALBERTO NEPOMUCENO (1862-1944): Symphony in G Minor, Brazilian Suite, Prelude to O Garatuja. Description: The 1893 symphony, one of the earliest Brazilian examples of the genre is also likely to be the best German Romantic symphony ever written by a non-German. It opens with powerful echoes of Brahms 3 and 4 and, throughout its four movements (its relatively compact size - 34 minutes - is a rather non-Germanic trait), you’ll be hearing elfin-lite Mendelssohn, thrusting Schumann and scherzo-ish Beethoven too. Nothing in the least Brazilian about it (it’s worth noting that one of Nepomuceno’s teachers during his seven years of study in Europe was Heinrich von Herzogenberg), which is 180 degrees from the other two pices here. Serie Brasileira (1891) is a vivacious four-movement suite (“Dawn in the Mountains”, “Intermezzo”, “Napping in a Hammock” and “Batuque”) that employs maxixe rhythms and ends with a feverish, almost frenzied batuque dance while the nine-minute prelude to an unfinished opera of 1904, using popular motifs from 17yj-century Rio de Janeiro, completes a captivating journey into unusual Brazilian symphonic repertoire. Great recording with wide stereo spread, depth and dynamic range. And then there’s this statement in the notes about this new series “The Music of Brazil” which is part of a project developed by the Brazilian Minisry of Foreign Affairs: “Around 100 orchestral works from the 19th and 20th centuries will be recorded by the Minas Gerais Philharmonic Orchestra, the Goiás Philharmonic Orchestra and the São Paolo Symphony Orchestra. Further recordings of chamber and vocal music will gradually be added to this collection.” Let’s hope it happens as planned!! Minas Gerais Philharmonic Orchestra; Fabio Mechetti.